Well, yes, some of us have been saying this for some time. Armstrong goes on to speculate, “… the way the numbers fall in Parliament may well force the Maori Party into a formal confidence-and-supply arrangement of the kind NZ First has with Labour.” As opposed to just abstaining. Armstrong’s mostly right. What I think he understates is the urge to deliver. Pita Sharples and Hone Harawira and others in the Maori Party are activists. It’s not in their natures to spend time on the sidelines and watch while others get to make the decisions. They’ve now had three years sitting impotently on the cross-benches, and they’re not interested in repeating the experience. 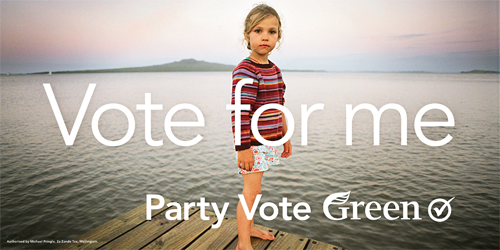 Also, I think people need to look at the obvious points that the Greens and Maori Party have in common. Environmental and social justice issues are core concerns for both, and the Green Party’s Tiriti o Waitangi policy is much closer to the Maori Party’s than anyone else’s. They look like natural partners. Soul mates even. And if they were to hold the balance of power after the election and get together to negotiate a common platform with the two main parties… That would amount to a seismic shift in the political landscape. Less Te Reo Maori badges. Better litracy. 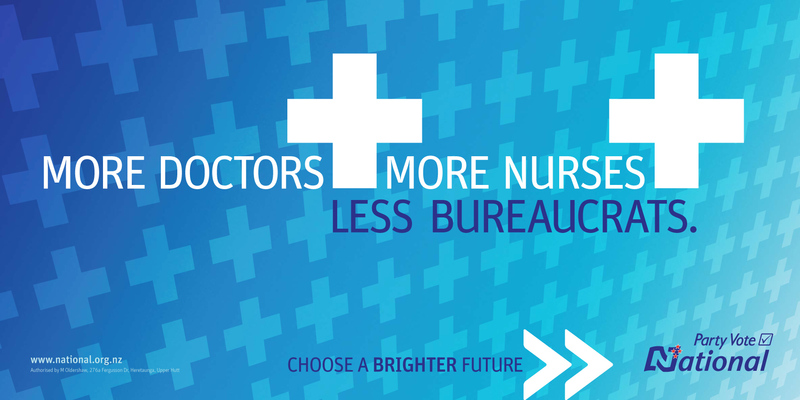 The Greens have opened up a new front in the battle of the billboards, with some neatly effective offerings. Chris Trotter gives them high praise. Meanwhile, the Nats’ efforts continue not to inspire. Whatever, it defies belief. Sure, the ETS on offer is a dog’s breakfast, and doesn’t go nearly far enough. But it’s better than nothing, which is what we’ll get from National. 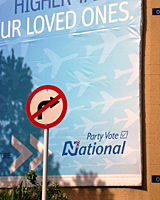 National has set an achievable emissions reduction target … a 50% reduction in New Zealand’s carbon-equivalent net emissions, as compared to 1990 levels, by 2050. But they have no hard policy on offer to achieve this. An emissions trading scheme for NZ. At last, some detail you say. Nope. I’m prepared to bet National’s understanding of where to strike the balance between environmental and economic interests is very different from the Green’s, for one thing. Greenpeace can see the stark realities of the situation. Take the bird in the hand, they say. Better still, the Greens should listen to Big Biz. They are keen to kick the ETS into touch, until their vassals are safely installed in power and we can be served up some toothless wonder of an ETS scheme that won’t achieve cost anything. It may be difficult to swallow, but it’s not really such a difficult choice to make. Who Shall Go to the Ball? Watching the various small parties position themselves in recent weeks, the words “rats” and “sinking ship” come to mind. But as Matt McCarten points out in today’s HoS column, Labour may be partly to blame for its predicament. Matt reminds us that after the last election Winston Peters and Peter Dunne refused to support a Labour-led government if the Greens were in it. He argues that this “set up the situation where Labour’s hegemony of the minor parties would ultimately fracture.” And so it seems to be coming to pass.